While its USP is that all of their projects are done with the painstakingly long process of “claymation”, Aardman has proven time and time again to be a studio that’s capable of more than just that; whether it’s in short length or with no words at all, they’ve crafted stories and characters that have a universal appeal and don’t need tons of plasticine to stand out. Their latest film, Early Man, is yet another example of how these animators can create something that’s wonderful and even inspiring to look at, while also telling a story with fun characters and a very British sense of humour to turn it into an entertaining and entirely inoffensive bit of fun for the whole family. Taking place in the prehistoric “Neo-Pleistocene” era, a young caveman named Dug (voiced by Eddie Redmayne) lives with his tribe in a small secluded valley where they hunt rabbits and generally live in peace. That peace, however, is rudely interrupted by the snarling Lord Nooth (Tom Hiddleston) of the nearby Bronze City, who drives the tribe out of the valley so he and his soldiers can mine for bronze. In order to regain his home, Dug challenges Nooth to a high-stakes game of the Bronze City’s most popular sport, which just happens to be football as we know it today. With the help of talented football fan Goona (Maisie Williams), Dug and his tribe train to beat the more experienced players of Nooth’s club Real Bronzio, and possibly save their home as well. Of Aardman’s films to date, this is probably the one that relies the most on formula; it’s a underdog sports movie, the kind that’s about the unlikely players who face off against the stronger opponents to win back something precious to them, and because it’s a formula that’s been tried and tested so many times you can easily predict where it’s all heading without many alterations or satirical elements added to it. Even so, there’s nothing wrong with an old formula as long as it’s done well with a good amount of crowd-pleasing and humorous moments thrown into the mix as well, and luckily Early Man is one that doesn’t take the formula too seriously. The comedy is pure Aardman, from the puns that are scattered in the background as well as the foreground, to the physical humour that never fails to get a giggle out of the youngest or even oldest audience member. The children in the audience I saw it with were absolutely cackling along with the film, and were so invested by the end that every victory for the heroes resulted in multiple cheers from at least one young boy who was having the time of his life at this film. Luckily, there were a lot of adults laughing as well, as there were enough visual gags to appease their sense of humour – a character shaves their stubble with a razor-sized beetle – to counteract some of the more juvenile examples of comedy like the odd fart joke every now and then. Everyone was clearly having fun with this film, as was I, and that’s the sign of a truly successful family film, when everyone and not just young children are genuinely having a good time watching it and not wishing they were somewhere else. As ever, the animation is truly special, but then again you must have known that about this company by now. Aardman’s traditional style of animation has always had that personal touch to it, from the earliest Wallace & Gromit shorts to where they’re at now, and given that this is directed by Nick Park who through his long career has not only put Aardman firmly on the map but has put every bit of his absolute love and adoration to the craft into everything he’s (literally) touched, you feel the passion even more knowing that a genuine animation legend is at the helm here. However, while he is indeed the main figurehead behind this project, let us not forget the countless amounts of animators who (also literally) have their fingerprints all over this film, and who have spent God knows how many months or even years carefully moving each and every plasticine model to make it look and feel as naturalistic as possible. Their efforts are not wasted, as everything they have put on screen looks wonderfully brought to life, including how hair and water naturally go along with the movements of the characters, and even the smallest things in the background that a lesser studio would have ignored or not paid as much attention to. Though again it may possibly be Aardman’s most formulaic plot to date – but again, as long as it’s done well, that’s no bad thing – Early Man is also their biggest crowd-pleaser in years, with characters that are fun and likeable, tons of the kind of humour that people naturally associate with them nowadays, and a story which, while certainly familiar, is simple and not too complicated to follow. This has the potential to break out strong with family audiences going into the forthcoming February half-term, or at least the ones not planning on seeing Black Panther when that hits cinemas, and even if it doesn’t exactly strike gold at the box office, like most of Aardman’s movies you can bet that there will still be an audience for it long after it leaves our screens. For example, remember when their CG movie Arthur Christmas didn’t do as well when it was released? Well, now it’s being regarded as a modern Christmas classic by critics and audiences, which only proves Aardman’s lasting power extends further beyond its initial theatrical release. If a fun and delightful family film made out of plasticine is what you’re after, then Early Man is the January treat for you. 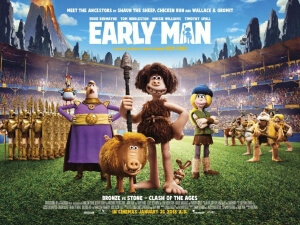 Early Man is another winner for Aardman, and while it may rely more on formula than any of their films to date, they atone for that with some fantastic animation, fun characters, often hilarious British humour, and a likeable crowd-pleasing tone that makes it a ton of fun for the whole family.